With the invention of the iPad came the transition into a more mobile workspace. Rather than being tied to your computer or a clunky external hard drive, you can now record straight to your iPad on the go. The ability to access your multitrack session anywhere and anytime is an incredible advantage when it comes to productivity. Working with a tablet allows for many beneficial features you may not get with a computer or laptop. We all know the pains of carrying our laptops and gear around. Whether it’s across campus or across town, it can get to be a bit much. Leave the heavy laptop at home and pack an iPad. Being under two pounds, you can carry your tablet wherever you go without creating burden. Not only is it light, but Apple has increased the processing power of the new iPad Pro to an unmatched level. The new tablet features a 64-bit A9X chip giving it the power to take on tasks once reserved for workstations and PCs. Having up to 1.8 times the CPU performance of iPad Air 2, the A9X chips allows you to do things such as edit 4K video with unparalleled smoothness. The iPad Pro will handle your multitrack session without a problem and keep you busy on the go. Staring at a computer screen for hours and moving the mouse around may get a little boring. Having a touchscreen DAW at your fingertips brings recording and mixing to life. Being able to push a fader up with you finger gives you that real studio feel that a trackpad can’t. Using touchscreen technology allows your iPad to transform from a workstation to an instrument. Some apps like Apple’s Garageband turn your tablet into a guitar or another virtual instrument! Hands on mixing gives you a new outlook on creativity. If you can have that studio vibe while on the go, you’re going to be more invested and more connected. Setting up your mobile studio can be time consuming when carrying multiple components. Recording on your iPad through Apogee equipment is as painless as plugging a single cord into your iOS device. Through your direct digital connection and external power source, ONE, Duet, and Quartet are able to charge your iPad while you record. You can now run professional multi-track recording interfaces through the convenience of your tablet without worrying about battery life. You’re getting the same quality sound you would anywhere you plug in an Apogee interface. Not only that, but Apogee has developed products such as the JAM and MiC specifically pioneered for studio-quality recording on iPad. 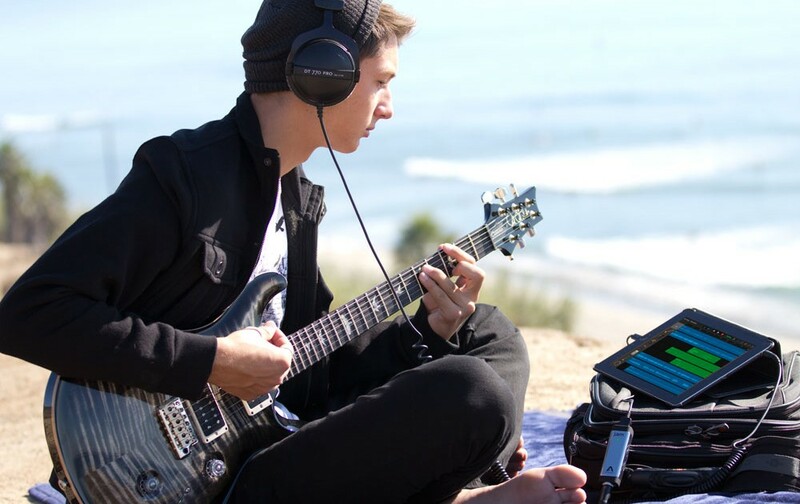 Record your guitar and vocals straight to your iPad unlike ever before. There’s no shortage of apps when you open Apple’s app store. Within the many options are hundreds of music apps for iOS and iPad. You are able to choose from a wide variety of digital audio workstations (DAWs) including Garageband and Auria among others. Once you’ve decided on your DAW of choice, you have plenty of apps for instruments and effects. Choose from synths and drum machines like Animoog and DM1 or utilities and guitar effects like Audiobus and JamUp Pro. Apogee also offers Maestro—the first audio interface control application for made for Mac and iOS. Maestro features a single window design and multiple tab interface for quick access to all devices and system settings allowing you to control your interface with ease. Now more than ever, the internet is one of the best places to push your new music. Whether you’re trying to build an audience or feed an existing one, places like Soundcloud and YouTube can encourage success. Most apps offer built-in sharing functionality that allows you to post to your accounts with a touch of a button. This feature is also handy when working on collaborations. Sharing websites such as Dropbox allow you to transfer session files easily to other artists and musicians in order to create a seamless workflow and get work done faster. For examples of recording on your iPad check out Apogee’s videos on tablet recording featuring iOS compatible devices. Convenience and reliability are more mobile and accessible than ever before. Ride the new wave of mobility and check out Apogee’s iPad compatible products.